Exciting reports from across the globe! Let me start with our recent Peru project: August 7th-13th we were in Iquitos, Peru, where we preached the Gospel at 5 Community Crusades, and in 2 private school outreach programs on Drug Awareness (public schools closed due to a spontaneous teachers strike). At our Pastors’ Conference there were 22 church leaders and we shared messages on systematic theology and personal evangelism, and we provided ministry resources to these leaders. 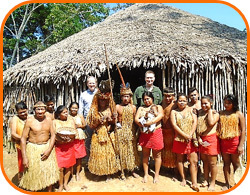 In addition, we took the Gospel to tribes who live on the Amazon River (top photo). God moved everywhere we went, and 195 Peruvians turned to Jesus Christ! INDIA: Our India leader, “Bob,” conducted E-Video Events in numerous Indian villages. Our team gave rice portions and tracts to everyone who came to listen to our video message— The Cross! 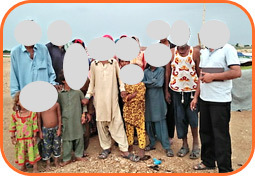 So far this year, 122 people have received Jesus Christ in these villages! One testimony is from the woman in the third photo, who is blind, holding the bag of rice we gave to her. Bob said, “she is a blind lady…she heard with her ears and accepted Jesus as her personal Savior!” Bob is busy now with the follow-up and giving Bibles to new Christians, and he is preparing future E-Events in more Indian villages! NEPAL: Our Nepal leader, “Rusty,” conducted our E-Video Events in local Nepalese churches (there are 83 churches in Rusty’s region alone where we plan to conduct video events). Our team gave salvation tracts and snacks to everyone who came to hear the Gospel of Jesus Christ! 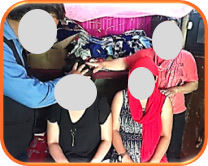 In the 4th photo below, Rusty and his wife pray over 2 ladies they led to Christ during the video event follow-up! PAKISTAN: Our Pakistan leader, “Mike,” provided snacks and juice to those who attended our E-Events, which are conducted in secret due to the radical Islam in Pakistan. Mike has seen 62 people commit to Christ this year! He regularly meets with the new Christians to teach them the Bible and provide study resources (bottom photo). So far, we have given 50 Bibles to new Pakistani Christians in their language, Urdu, and we plan to purchase and give more! My home church, Houston’s First Baptist Church, has donated an $11,250 Challenge Gift to our ministry with this challenge to our donors and friends…to not just meet, but to double, their gift! Meeting this challenge will provide $33,750 to our ministry, and will greatly help us develop our E-Event Video Teams ministry…enabling them to continue sharing the Gospel, and giving food, Bibles, and resources, to people living in the most desperate conditions in the world! Meeting this challenge will also help us continue our evangelistic crusade events, church ministry training, drug awareness school programs, Bible & tract distribution, and free transportation to people who attend our crusades. Will you please help us meet this challenge gift? 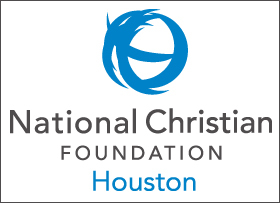 Your special donation can be designated to “Houston’s First Baptist Challenge Gift.” Thank you for your help!